Home Baking Thermomix: Sheba’s (canine) birthday, carrot & mince meat cake. 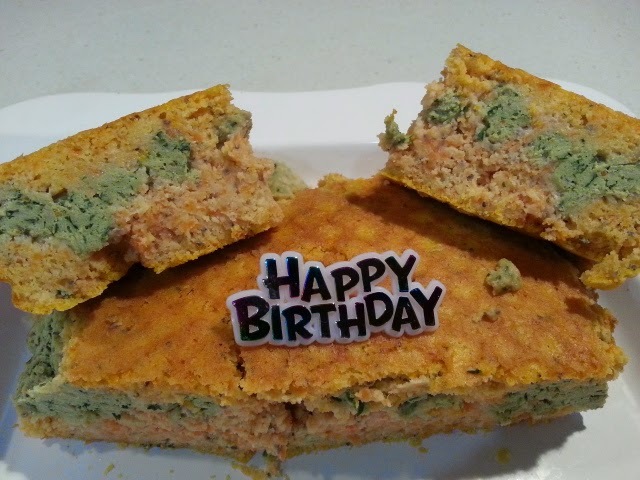 Thermomix: Sheba’s (canine) birthday, carrot & mince meat cake. Gluten free, Dairy free, Sugar free Canine Cake. We both are do not consider our dogs pets. They are our family. For us they are our kids. We both are not celebrate our birthdays. But We do celebrate our furry kids birthdays. This gluten, sugar & dairy free cake is healthy and tasty. You can add your puppy’s liking chicken mince or any other mince meat. Preparation time10 minutes plus baking times 35 to 40 minutes. Grease a 22 cm x 22 cm round baking pan or 21 cm x 21 cm square baking pan; set pan aside. Place flour, chia seeds and turmeric into TM bowl. Mix for 5 seconds, speed 5. Set aside. Place carrots into TM bowl. Mince carrots in 7 seconds, speed5. Set aside. Place herbs into TM bowl. Chop for 3 second, speed 7. Place chicken mince and 2 tbs oil into TM bowl. Mix for 6 seconds, speed 5, reverse. Set aside. Place water, 1/4 cup oil and eggs into TM bowl. Beat for 5 seconds, speed 5. Place minced carrots, mix for speed 4, 5 seconds. Place flour mix (with chia seeds and if you want use turmeric powder) into TM bowl. Mix for 15 seconds, speeds 3, reverse. Pour 1/3 of the batter into prepared cake pan, spread the chicken mix on top of the cake batter, then 2/3 left cake batter over the chicken mix. Use the spatula and nicely cover the chicken mixture with the cake batter. Bake in a 180 degree celsius oven ( fan force oven 170 degree celsius) for 30 to 35 minutes or till a wooden toothpick comes out clean. Cool cake on wire rack for 5 to 10 minutes. Remove cake from pan. Cool thoroughly on wire rack. Next articleSlow cooked spicy lamb forequarter curry.